Corporal Luther Skaggs, Jr. (3 March 1923 - 6 April 1976) was a U.S. Marine who received the U.S. military's highest award for valor, the Medal of Honor, for his heroic actions on the beachhead on Guam during World War II. Luther Skaggs, Jr. was born on 3 March 1923 in Henderson, KY. He entered the U.S. Marine Corps on 6 October 1942, and received recruit training at Parris Island, SC, and Camp Lejeune, NC. He was deployed overseas on 1 March 1943. Private First Class Skaggs, a squad leader with a weapon section in the 3d Battalion, 3d Marines, 3rd Marine Division, was critically wounded when a Japanese grenade exploded in his foxhole during the night of 21-22 July 1944 on the Asan-Adelup beachhead on Guam. But instead of calling a corpsman and revealing his outfit's position, he calmly applied a tourniquet to his shattered leg and for eight hours continued to return the enemy's fire with his rifle and hand grenades. In his Medal of Honor citation, Skaggs is commended for being uncomplaining and calm through this critical period and serving as "a heroic example of courage and fortitude to other wounded men." Private First Class Skaggs was referred to as a "tough little guy" by his buddies, who didn't even know that he had been hit until the battle was over. Only when the Japanese in the area had been annihilated did he seek medical attention. Skaggs lost his leg as the result of the wound. 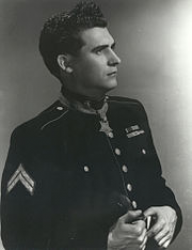 For his heroism and selflessness, Skaggs was awarded the Medal of Honor. Place and date: Asan-Adelup beachhead, Guam, Marianas Islands, 21-22 July 1944. Citation: For conspicuous gallantry and intrepidity at the risk of his life above and beyond the call of duty while serving as squad leader with a mortar section of a rifle company in the 3d Battalion, 3d Marines, 3d Marine Division, during action against enemy Japanese forces on the Asan-Adelup beachhead, Guam, Marianas Islands, 21 -22 July 1944. When the section leader became a casualty under a heavy mortar barrage shortly after landing, Pfc. Skaggs promptly assumed command and led the section through intense fire for a distance of 200 yards to a position from which to deliver effective coverage of the assault on a strategic cliff. Valiantly defending this vital position against strong enemy counterattacks during the night, Pfc. Skaggs was critically wounded when a Japanese grenade lodged in his foxhole and exploded, shattering the lower part of one leg. Quick to act, he applied an improvised tourniquet and, while propped up in his foxhole, gallantly returned the enemy's fire with his rifle and hand grenades for a period of 8 hours, later crawling unassisted to the rear to continue the fight until the Japanese had been annihilated. Uncomplaining and calm throughout this critical period, Pfc. Skaggs served as a heroic example of courage and fortitude to other wounded men and, by his courageous leadership and inspiring devotion to duty, upheld the high traditions of the U.S. Naval Service. 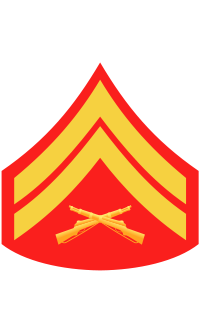 Skaggs was promoted to Corporal upon being honorably discharged from active service in the Marine Corps on 4 April 1946. Corporal Luther Skaggs, Jr. died on 6 April 1976. 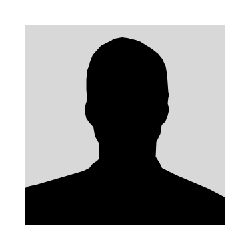 He is buried in Arlington National Cemetery in Arlington, VA, in Section 46 Lot 1066-B. 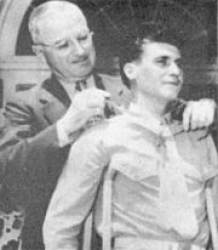 Luther Skaggs, Jr. receiving the Medal of Honor from President Harry S. Truman.